I'll Cross That Leg When I Get To It.....: A Blogger Award Received and Passed On! 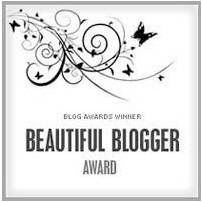 A Blogger Award Received and Passed On! I am all giddy with excitement! I received a blogger award from Meari at Meari's Musings! Meari and I have emailed a couple of times and I am hopeful, that at some time in the future we might actually meet up in person, but I never expected her to give me an award. Thank you so much Meari, you can't possibly know how much this means to me. 3) Add a link to the person who gave you the award. 4) Put the award on your blog. 5) Write 10 things about yourself others might not know about you. 6) Pass the award on to 10 others. Now to tell you 10 things you might not know about me. This is a tough one. I'm a pretty boring person all things considered but I will give it my best shot. 2. When I started writing, I wrote upside down and backwards. 4. I didn't drive until I was 22. 5. My favorite sound is the creak of a leather saddleas you ride down a dirt road dappled with sunlight. 6. I didn't know how to cook until I was 20, married and starving. 8. I cleaned hotel rooms when I was in High School and was serenaded by a band member while cleaning his room. 9. I speed dated in college before speed dating was even invented. 5 dates, 1 night, no hanky panky . 10. I lived in a haunted house for a year and a half. 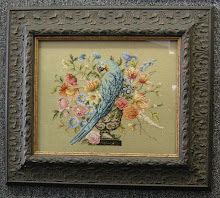 Thank you all for sharing your lives and your love of stitching with me! Julie! I'm beaming!!! Thank you! Oohhh...pirates and haunted houses.....great facts! So, pirates AND a haunted house...you should write a book!!! Oh, I dunno. Those facts are pretty interesting to me! Who was the band member? Very interesting!! I enjoyed reading about you. Thank you Julie!!! What a sweet surprise - I have a pretty boring life too, let's see if I can come up with 10 things also!! !